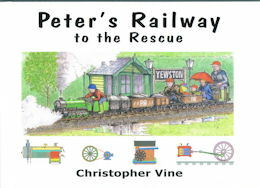 The railway built by Peter and his Grandpa runs across the farm, between their houses. It makes visiting each other a lot of fun and there have been many adventures along the line. The locomotive, Fiery Fox, belongs to Mr Esmond, but Peter and Grandpa have made everything else themselves: The track, wagons and even the little buildings at the stations. In this story Grandpa is left looking after the family. Whatever will he do to entertain Peter and the young twins, Kitty and Harry? And what will it lead to?